Welcome Dear Readers to this week’s edition of Gregory’s Bible Stories! Today in Sunday school Gregory gave an oral report on how Lot’s family manged to escape the destruction of Sodom and Gomorrah and their Chamber of Commerce mixer. One biblical evening in Sodom when Lot, his wife, Betty, and his two daughters, Mary Magdalene Kate and Ashley were about to sit down to feast with two of God’s best-looking angels, an angry mob began pounding on Lot’s door. Angry mob: Tis us– the Sodom and Gomorrah Chamber of Commerce. We came to get God’s two best-looking angels and take them to our Sodom and Gomorrah Chamber of Commerce mixer. Best Looking Angel #1: Would you mind telling them, Lot, that we’d rather die but thanks anyway? Best Looking Angel #2: Oh and speaking of dying, Lot, I almost forgot our whole reason for coming. HA! The Lord sent us to get you and your relatives out of Sodom and Gomorrah before He pushes His almighty destruction button and turns it to Smithereens. Lot: Smithereens? Are you sure you don’t mean Nazarenes? BLA #2: No. You see the Lord is going to wipe Sodom and Gomorrah off the face of the planet. BLA#2: Oy! Okay let me put it in a way your more likely to understand. How would you like to hear a Sodom and Gomorrah knock knock joke? BLA#2: Armageddon through to you? If the Lord destroys Sodom and Gomorrah, you’ll be toast! Lot: But I love toast. Shall I let the Sodom and Gomorrah Chamber of Commerce in now? Suddenly one of the angels looked into the sky and saw that it was partly cloudy with a 90 percent chance of burning sulfur rain. So they took the hands of Lot and his wife and daughters and lead them out of the city of Sodom and told them to run for their lives up into the mountains lest they become toast. Lot: But my feet are killing me as my sandals have no arch support. Couldn’t we just go to that little town up ahead? The Lord: (this is where the Lord decided to get in on the conversation): All right, I agree. I won’t destroy that town. Hurry Run! I can’t do anything until you get there. The sun was rising when Lot and his family schlepped into the little town that Lot had renamed Zoar on the way there because he thought Zoar meant “little town” but it really meant “good arch support” but nobody had the heart to tell him that. 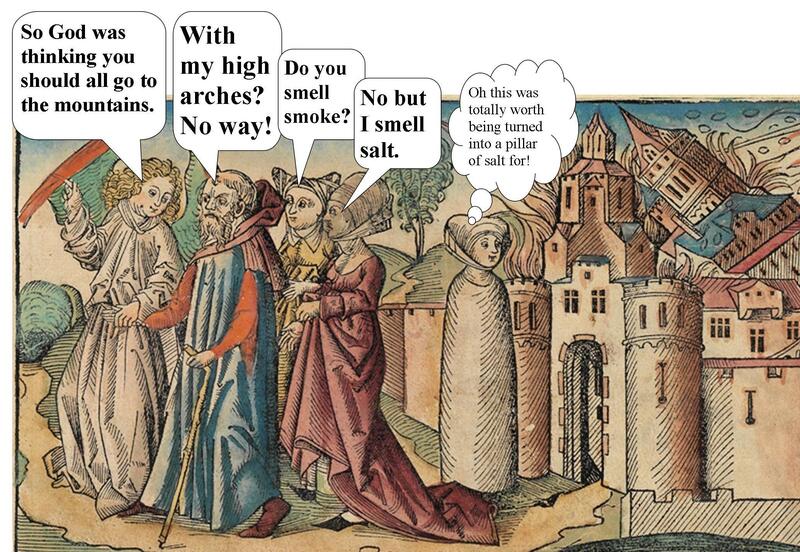 Everybody wanted to watch as the Lord rained down burning sulfur on the city of Sodom and Gomorrah but nobody did except for Betty who instantly turned into a pillar of salt — which of course left Lot feeling horrible. After that, Lot was forced to grieve alone as there were even fewer support groups for Pillar of Salt Widows then than there are today. Luckily Lot was able to finally recover from his grief and went on to become a charter member of the Zoar Chamber of Commerce where he made sure toast was served at all the mixers. And there you have it, Dear Readers, what Gregory learned in Sunday School. Stay tuned next week to find out what Gregory learns next. I know if I scroll through far enough into blog land I will come across your uplifting and informative Sunday lesson. Hope your Sunday is going well for you Linda, mine was quiet as are most Sunday’s around here, I’m glad it was all yesterday too as Mondays are fun days i always think. Enjoy your week. Mondays are fun! But I do enjoy a quiet Sunday too. And fall is coming up which has lately become my new favorite season. There’s a peacefulness in the air that no other season can match! You take care Michael! Have a wonderful week! Haha! I think Gregory is going to work his way through the bible story by story and see how far he gets!